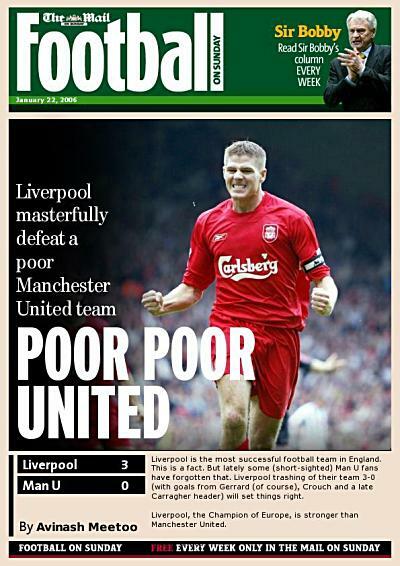 … with goals from Gerrard, Crouch and Carragher! I am a united fan, but sincerely, it’s Liverpool who deseved to win. Nice to hear from you Arshaad. What are you up to now? Where are you working? AHA, he is not a true United fan! Traitor!!! *cough* Eric come back! Please! Maybe after that I’ll revert back to IT. Thanks 4 averything Sir – ur ideas, the way u teach, everything. It was gr8 and a real pleasure knowing you. My teaching philosophy is to make students LIKE what they are learning. When someone likes something, everything become easy (and fun). Talking of ur teaching philosophy…. Think there are few in your classes who ‘actually’ ride on the crest of technology: latest programming news, latest gadgets. I remember the first time you lectured us, there were a majority of blank faces. As you mentioned, noone really cares abt reading , never mind at least glancing at a few pages of mags like PC World, Computer Power User and Doctor Dobbs Journal (which are all freely available on the mags ‘scene’ these days). After all, few care and would rather compete among themselves with what they have in their books and study materials only. After all, we need those technologies for the future and the more we discuss abt them, the more we learn and the richer we become. Is that instilled in us? Not for the time being. When I give a lecture, I always try to be complete and to make concrete references either to past, current or future technologies and scientists. This, in fact, requires a lot of preparation work. My personal rule is: “Make the lecture as complete and interesting as I would have liked it to be if I was a student”. Of course, there are still many improvements that I can think of, but we’re moving in the right direction. This was like ages agooo. Liverpool r da best. Man u suk!!! !